Another month goes by on ppc.org which means another catch up with all the best articles that will help you the most. Although not much has changed in the PPC world since January, this won’t stop a PPC advertiser learning something new and below are some of the best articles from myself in February that will hopefully let you learn something new. I made 13 articles in February 2012 and I can admit that all of the articles might not relate exactly to you or another PPC advertiser’s campaign. For this reason, I have again selected what I believe to be the best articles I created in February that will help you in pay per click and AdWords the most. Many businesses decide not to use PPC for many reasons. Maybe they don’t like change and would rather keep to a more traditional form of advertising. Maybe they simply don’t have the time to learn this new type of online advertisement. Either way, they should think again. PPC is a lot more beneficial to businesses than most businesses think. Instead of trying to think of a business that uses PPC, try to think of a business that doesn’t use PPC. Everyone uses it for these benefits. This article goes into great detail about what you should expect when at the beginning of a new year in PPC. What will affect your campaign this year? It’s a mystery as trends are changing more often than ever. For this reason, this article will give you a ‘heads up’ as an advertiser about what you should expect. It goes along the lines of PESTEL: an abbreviation of the external factors advertisers will have to acknowledge and face. Should You Join PPC Campaigns Together? This article brings up an interesting question amongst PPC advertisers. With the current economic crisis forcing businesses and advertisers to lower their budgets, advertisers are resorting to merging campaigns together. However, is this going to benefit the two once separate campaigns? This article goes into detail about two types of merges: horizontal and vertical. Alright, it might not be the biggest mistake. Yet, it is a mistake many PPC advertisers do which cause them to become on the back foot. Three simple words that can change your PPC campaign for the better. Using bullet points, headings and quotations, this is a must read for any advertiser. Now becoming a big hit on ppc.org, the previous episodes in the series “Some Useful PPC Articles” contains some of the best articles I have made on ppc.org. From creating an advert to analysing landing pages to even the different types of landing pages there are, these articles contain a lot of what a PPC advertiser experiences and ways to improve their experience and success. There’s nothing better than a spot of history! Considering you may have been in the PPC market for years, it is extremely helpful to get a historical background check on how advertising and PPC started. This is exactly what this article does. From all the way back to 2000BC to present day, I bullet point all the most significant events that are related to advertising. 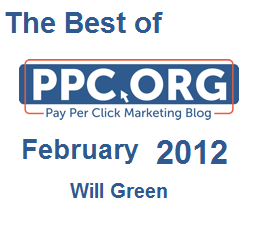 There’s the top seven best articles I believe I created in February 2012 that will benefit you the most. I hope this has proved useful to you like it has for so many other people.